Best Practice: If this is the first time loading a particular data set, or if there have been any recent changes to the file format, it's always a good idea to test out data uploads in the Development database, just to make sure everything loads smoothly. For more information on the fields available for each 'type' of load, click here to read more. Click Upload Data in the Bulk Data section. The Upload Data screen displays. When you first get to the main Bulk Upload page, the options that appear at the top of the page allow you to Filter all of the results of previous uploads (that appear in the table below). So unless they need to look at results from previous loads, they can just immediately hit "New Upload"
Zoom: A sample of the Upload data screen, with the 'All' type selected so that all past uploads are displayed. In most instances, it is not necessary, but you may need to Select the unit for which the data is being uploaded. Most data is uploaded at the university level, even if it is for a subunit. The data will flow down to each unit as necessary. In the Type list, select the type of data being uploaded. Click New Upload. The New Upload screen displays. Depending on the type of data being uploaded, the information in the Current Upload Fields section, and other options in this screen, will differ. Confirm the type of data being uploaded. Select the academic term for which data is being uploaded. The Update Duplicate Records (Update Existing Records) check box provides administrators with the option of choosing to upload duplicate/existing records (if the record already exists in FACULTY180, both records will be uploaded), or ignoring duplicate/existing records and only uploading new records. This option is not applicable to all data types. Select the unit for which data is being uploaded is selected. Select the file to be uploaded in the Choose File section. If the file contains a header row, select the File Has Header Row check box so the data in the header row is not uploaded. Validate the file format by clicking Validate. The file format will be tested before the file is uploaded. After the file is validated, click Upload to start the upload process. After the upload process is complete, you can view the details for the uploaded file. Any duplicate files can also be viewed, if applicable. Note: Either direct or indirect methods of data uploads can be used. 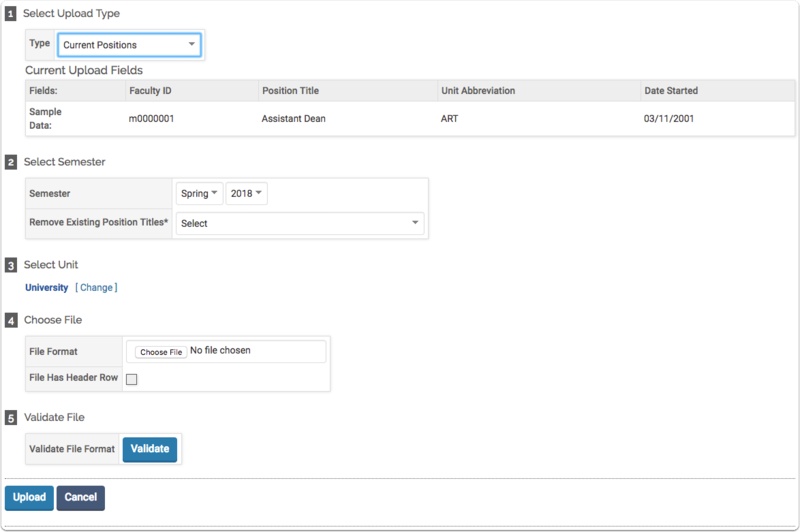 When uploading faculty data, administrators can disable logon access to FACULTY180 for inactive faculty accounts that are not included in faculty uploads. In the Bulk Data section, click Upload Data. The Upload Data screen displays. 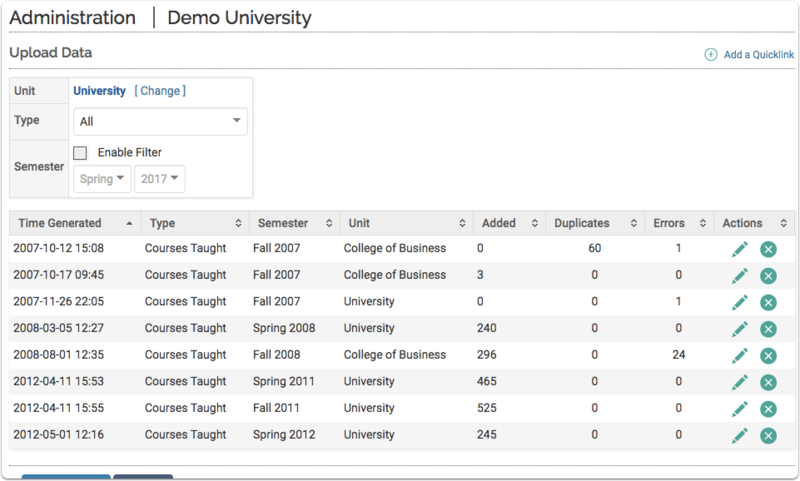 In the Select Upload Type list, click Faculty. 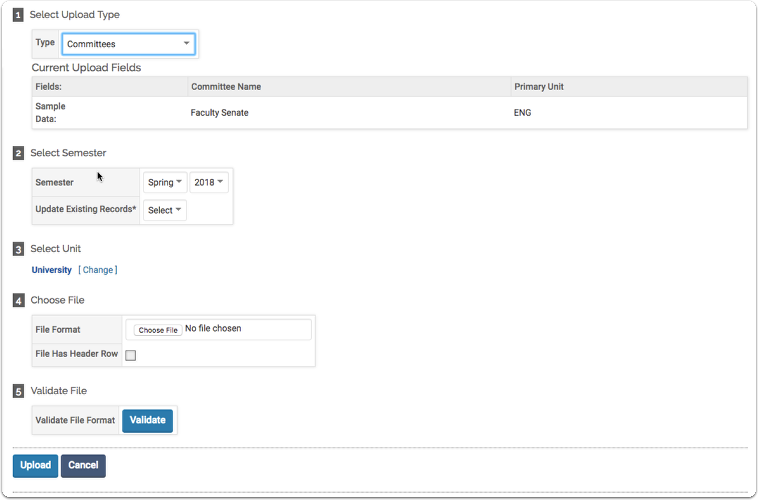 In the Select Semester section, select the Check To Inactivate Faculty Not In Upload checkbox. The Check To Inactivate Faculty Not In Upload dialog box opens. 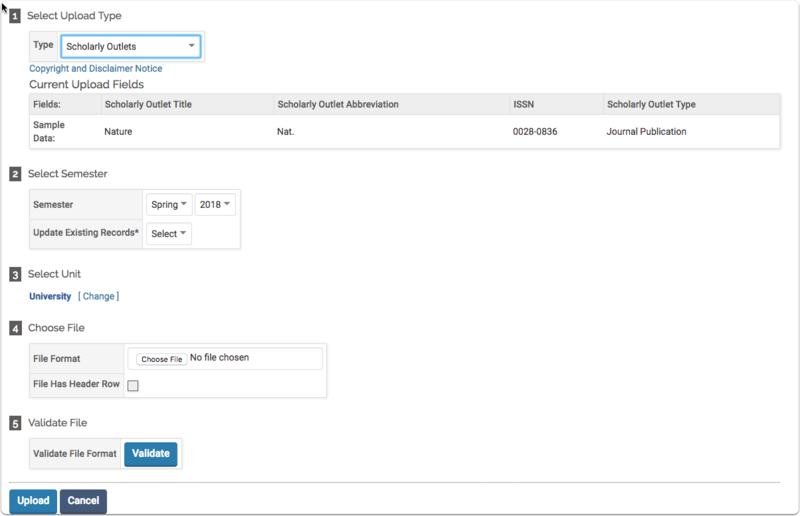 Select the type of faculty accounts (based on employment status) that should be inactivated and not included in the faculty upload. Select the Disable login status for the users selected above check box if FACULTY180 access for the selected inactive users should be disabled. If you are receiving validating errors, you must check the data to ensure that it is being uploaded properly with the selected Upload Form. Typically validation errors occur because the selected spreadsheet has either too many or too few columns. The other reason would be if they are trying to load a file that isn't .csv format. If there are fields that you believe should be present, it may be that the upload form needs to be updated in the Upload Form page, within the Configuration section of the Setup page in the Administration tab. On the New Upload screen, within the Bulk Data section, you are able to choose the type of upload you would like to perform in 1- Select Upload Type, as displayed below. Once you select an upload type, the page will update to the relevant form to capture the relevant information. Below, you can expand each section to dive deeper into the form and it's fields. 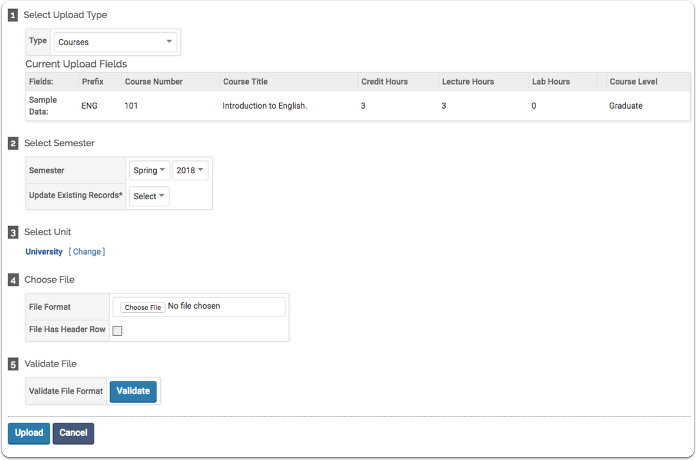 After selecting Courses Taught in the Type field, the page will update to display the upload form for that data type. In Section 1, you can re-choose your Type, and you can see a sample of the current upload fields. If the current upload fields are not what you expected, you likely have to go modify the Upload Form in the Setup menu of the Admin tab. Prefix Prefixes In system Yes Yes Prefix must match on all course files. Course Number Text Yes Yes Course number must match on all course and courses taught files. Course Designation Text Yes (if used) No The Course Designation field contains an additional key field that can be used to separate a 'like' course. 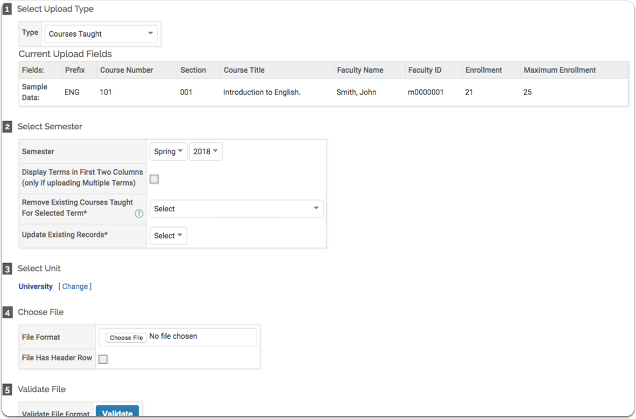 If the Prefix and Course Number are the same, the Course Designation field can hold another value to separate enrollment values or other values as needed. Semester - Choose the relevant semester for the data that you are uploading. Display Terms in First Two Columns (only if uploading Multiple Terms) - If you are uploading multiple terms of data, select this option to add two additional fields in the first two columns 'Semester' and 'Calendar Year'. Your data must have these columns at the start of the data, as depicted in the preview, when checked. 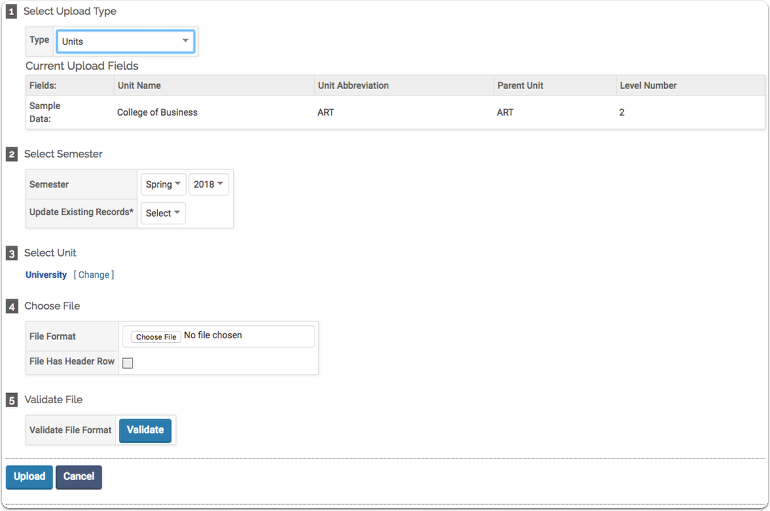 If enabled than the semester field will not be available. Yes, remove courses taught not in the upload. Select this option to remove all previous courses taught that are not within this upload. So if a course was taught last semester, and it is not included in this upload, than it will not be removed from the selected terms Courses Taught records. Yes, remove courses taught for users in the upload. Select this option to remove all previous courses taught records ONLY for uses that are NOT within this upload. So if a user is in this upload, and they are not indicating as teaching a course any longer, than it would be removed from their activity record for the selected term. No, just add new courses. Select this option to not remove any Courses Taught information for the selected term. Update Existing Records* - You can choose whether or not you would like to update any existing records. If you select no, new information will not be applied to data that already exists in the system. 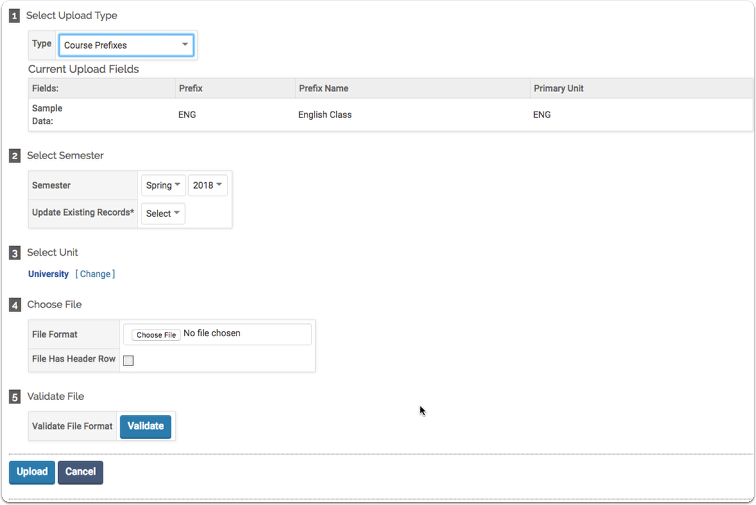 After selecting Faculty in the Type field, the page will update to display the upload form for that data type. In Section 1, you can re-choose your Type, and you can see a sample of the current upload fields. If the current upload fields are not what you expected, you likely have to go modify the Upload Form in the Setup menu of the Admin tab. Yes Only four exact values available. 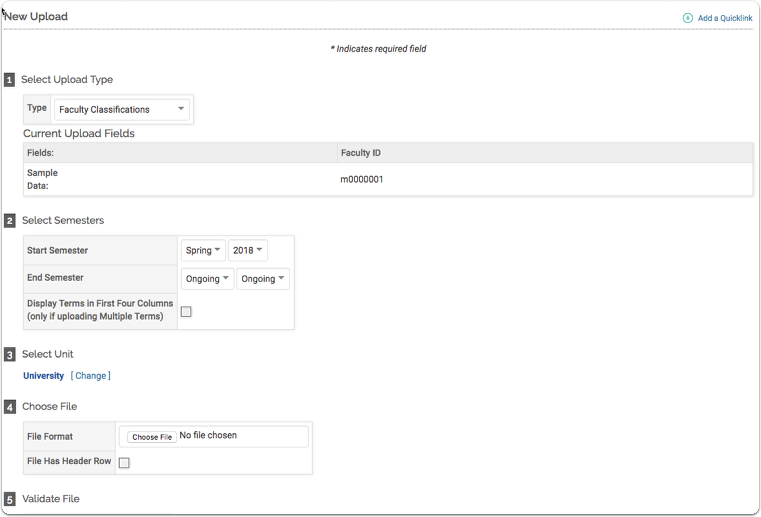 Check to Inactivate Faculty Not in Upload - By selecting this field, faculty members who are not listed in the data being uploaded, but do have an account, will be marked with an employment status of Inactive. To inactivate faculty based on their employment status (FT, PT, Staff). To choose to inactive those faculty for just the current term, or you can choose to inactivate them indefinitely. Update Existing Records* - If a record currently exists in the system for the data being uploaded, this will allow those records to be updated with the information that is within the uploaded file. Respect Locked Preferred Names* - If a user's preferred name has been 'locked' than by selecting 'Yes', their name will not be altered by this new upload. After selecting Courses in the Type field, the page will update to display the upload form for that data type. In Section 1, you can re-choose your Type, and you can see a sample of the current upload fields. If the current upload fields are not what you expected, you likely have to go modify the Upload Form in the Setup menu of the Admin tab. Prefix Prefix in system Yes Yes Prefix must match on all course files. Course Number Text Yes Yes Course Number must match on all course files. After selecting Course Prefixes in the Type field, the page will update to display the upload form for that data type. In Section 1, you can re-choose your Type, and you can see a sample of the current upload fields. If the current upload fields are not what you expected, you likely have to go modify the Upload Form in the Setup menu of the Admin tab. Prefix Text Yes Yes Prefix must match on all course files. After selecting Committees in the Type field, the page will update to display the upload form for that data type. In Section 1, you can re-choose your Type, and you can see a sample of the current upload fields. If the current upload fields are not what you expected, you likely have to go modify the Upload Form in the Setup menu of the Admin tab. After selecting Units in the Type field, the page will update to display the upload form for that data type. In Section 1, you can re-choose your Type, and you can see a sample of the current upload fields. If the current upload fields are not what you expected, you likely have to go modify the Upload Form in the Setup menu of the Admin tab. 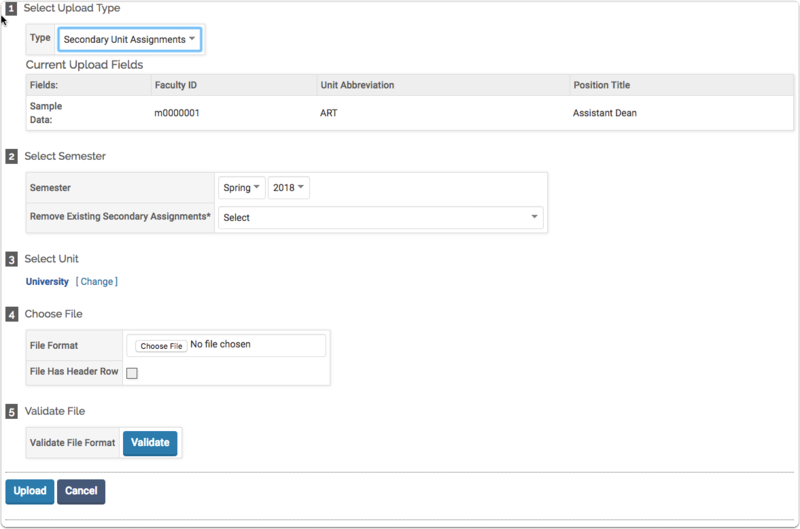 Y (if used) An external ID can be used if there is a conflict between the unit abbreviation value related to the faculty file (HR) and the unit abbreviation related to course prefixes (student). An 'external ID' field can be added to the source of record for both and the value would be identical. This is how the 'match' will occur in Faculty180. After selecting Faculty Classifications in the Type field, the page will update to display the upload form for that data type. In Section 1, you can re-choose your Type, and you can see a sample of the current upload fields. If the current upload fields are not what you expected, you likely have to go modify the Upload Form in the Setup menu of the Admin tab. Faculty ID Text Yes Yes Additional Faculty Classifications will be added specific to accreditation reports and/or institutional initiatives. Start Semester & End Semester - Choose the relevant semester range for the data that you are uploading. Display Terms in First Four Columns (only if uploading Multiple Terms) - If you are uploading multiple terms of data, select this option to add four additional fields in the first four columns 'Semester' and 'Calendar Year', and 'End Semester' and 'End Calendar Year'. Your uploaded data must contain these four columns, as depicted in the preview when enabled. When checked the semester fields are no longer relevant. 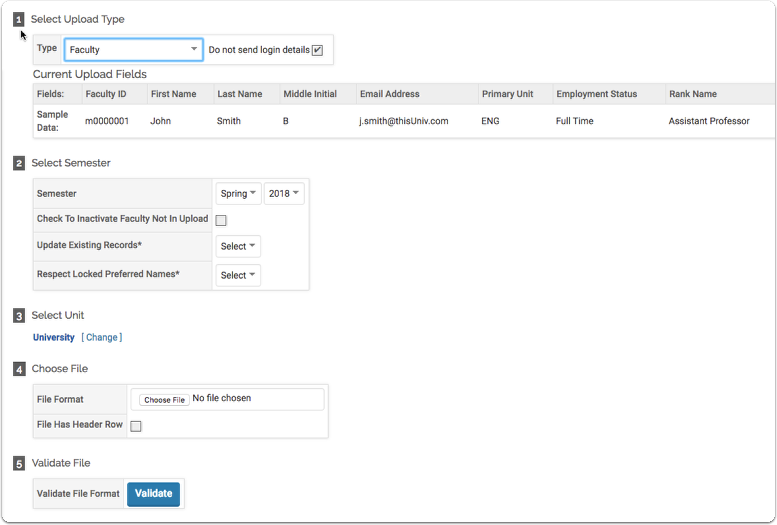 After selecting Current Positions in the Type field, the page will update to display the upload form for that data type. In Section 1, you can re-choose your Type, and you can see a sample of the current upload fields. If the current upload fields are not what you expected, you likely have to go modify the Upload Form in the Setup menu of the Admin tab. Yes, remove all existing positions titles. - All existing position titles will be removed. Yes, remove all existing positions for user in upload. - All existing position titles will be removed, if the use was in this upload. No, update existing position titles. - Update all of the existing position titles, with the ones relevant to this data load. 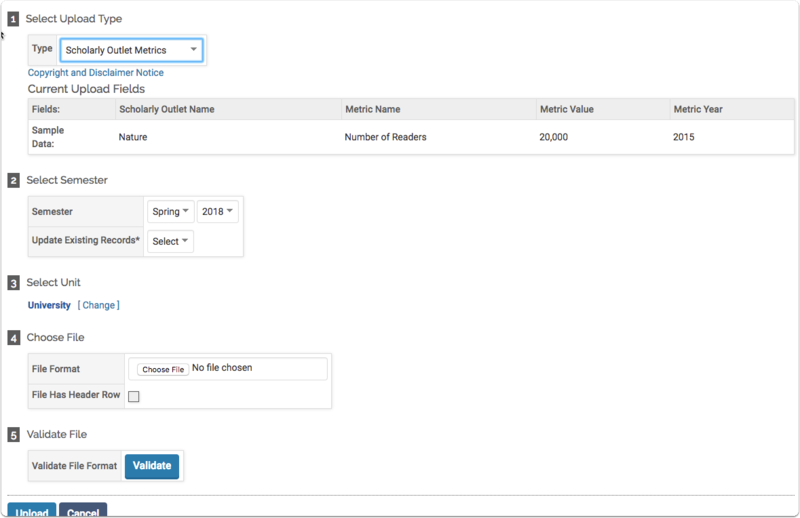 After selecting Scholarly Outlet Metrics in the Type field, the page will update to display the upload form for that data type. In Section 1, you can re-choose your Type, and you can see a sample of the current upload fields. If the current upload fields are not what you expected, you likely have to go modify the Upload Form in the Setup menu of the Admin tab. Scholarly Outlet Type Text The Outlet Type is the Sub Type in the Scholarly Contribution section. After selecting Scholarly Outlets in the Type field, the page will update to display the upload form for that data type. In Section 1, you can re-choose your Type, and you can see a sample of the current upload fields. If the current upload fields are not what you expected, you likely have to go modify the Upload Form in the Setup menu of the Admin tab. 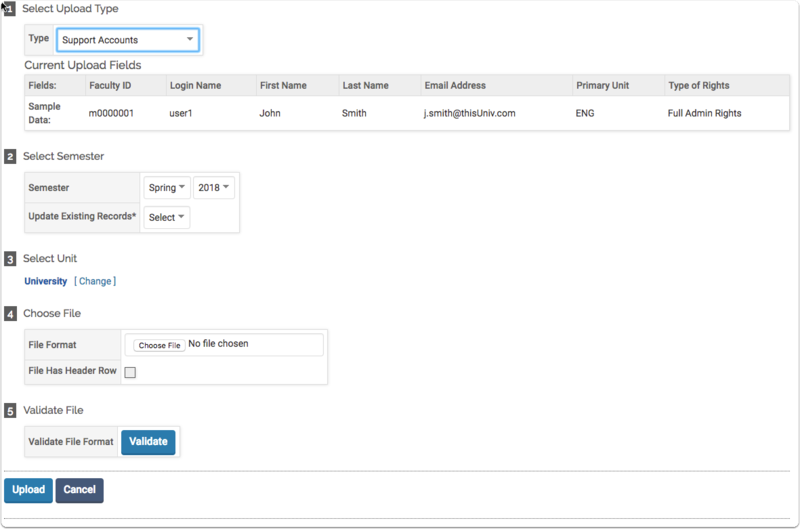 After selecting Secondary Unit in the Type field, the page will update to display the upload form for that data type. In Section 1, you can re-choose your Type, and you can see a sample of the current upload fields. If the current upload fields are not what you expected, you likely have to go modify the Upload Form in the Setup menu of the Admin tab. 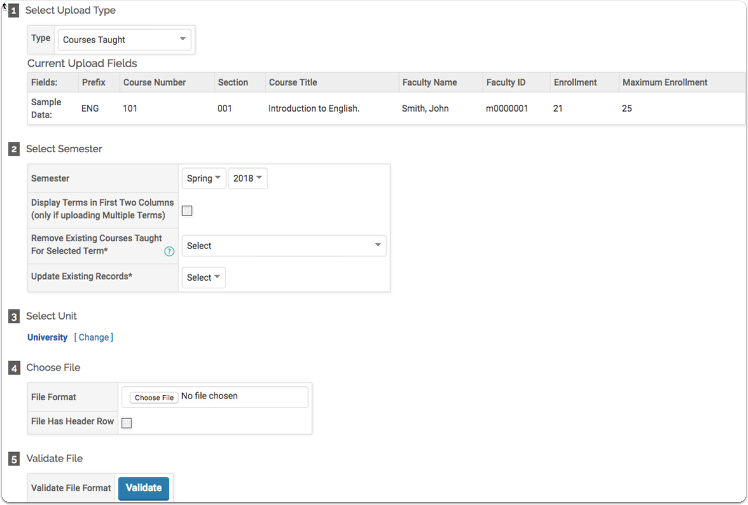 An external ID can be used if there is a conflict between the unit abbreviation value related to the faculty file (HR) and the unit abbreviation related to course prefixes (student). An 'external ID' field can be added to the source of record for both and the value would be identical. This is how the 'match' will occur in Faculty180. Remove Existing Secondary Assignments* - Choose whether not existing secondary assignments should be preserved, or removed. After selecting Support Accounts in the Type field, the page will update to display the upload form for that data type. In Section 1, you can re-choose your Type, and you can see a sample of the current upload fields. If the current upload fields are not what you expected, you likely have to go modify the Upload Form in the Setup menu of the Admin tab.